The Irish Story has a great post exploring links between one of the early 19th century agrarian secret societies and the Irish hedge school. The period of the 1820s was a tumultuous time for the Irish nation as it struggled to search for an identity within the Union and, with difficulty, sought to adapt to change in an age of radical thought and religious fervour. 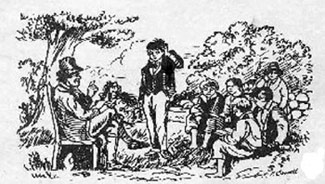 The notion of the overarching power of the hedge schoolmaster on Irish Catholic agrarian society is one example, found in both contemporary works and recent scholarship, of an attempt to understand the complex political, religious and economic effects on the mentality of Irish society which culminated in the Rockite movement of 1821 to 1824. Researches in the South of Ireland, Thomas Crofton Croker, 1824. Irish hedge school. From The Irish Story. This entry was posted in History, Politics, Religion and tagged Hedge school, Rockite on March 29, 2014 by admin.